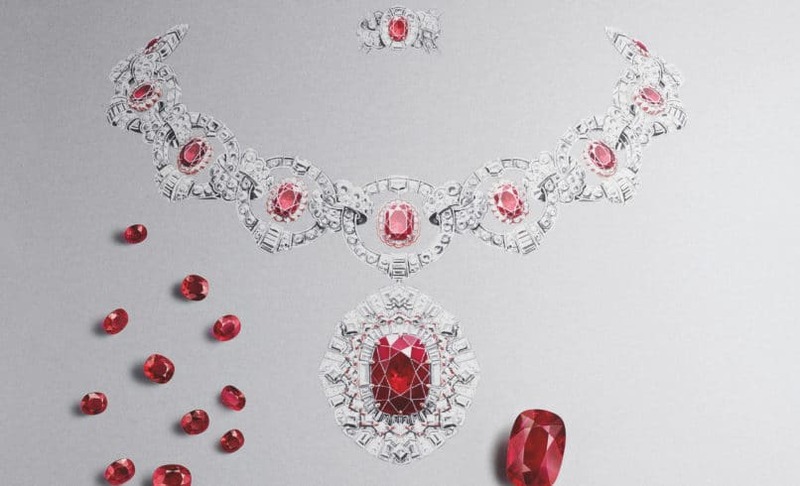 Van Cleef & Arpels has long sung a sweet sonnet for the stone, and in its latest high jewellery collection, proves why when we talk about rubies, the French luxury jewellery maker is the leading name in the game. Entitled ‘Treasure of Rubies’, the new collection brings together the Maison’s history and passion for the burning ember, composed in the signature aesthetic the brand famously revels in. Made up of 60 unique pieces, Treasure of Rubies showcases the majestic beauty of the ruby, linking together over 3000 carats of certified rubies collected over many years. 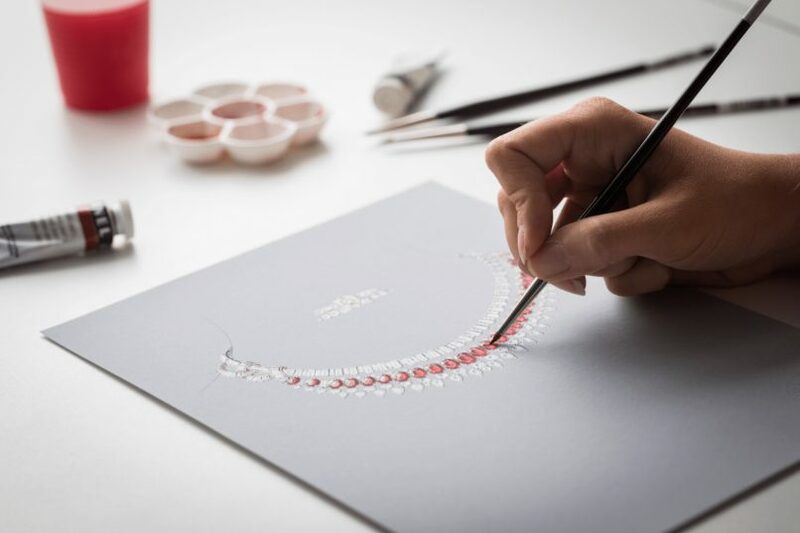 The line sees the continuation of the radiant red adventure which began in 2016 with the launch of Van Cleef & Arpels Émeraude en Majesté, and with the new collection invites admirers once again to embark on the pomp and poetry of the Oriental king of gems. The ruby is a highly sought-after stone – in exceptional quality even rarer than the diamond – and has fascinated civilisations the world over since its discovery. 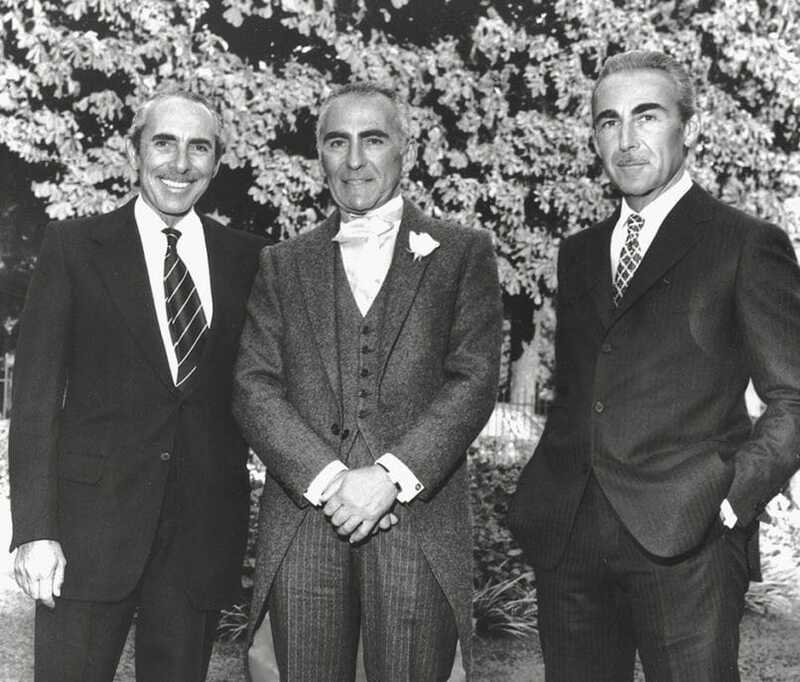 For Van Cleef & Arpels, the affable affair began over a century ago, serving as the source of inspiration for some of the brand’s most emblematic creations. In fact, in a conversation with a journalist in 1982, Jacques Arpels famously quoted that rubies were his ‘favourite stones’. Revealing various nuances and fires, the ruby invites its onlooker on a journey into the heart of colour in a variety of ways. The first pieces were used most notably by Van Cleef & Arpels in the 1937 Peony Clip. Once the property of Princess Faiza of Egypt, and a regal expression of the Maison’s soon-to-be most enduring characteristics: floral themes and Mystery Set technique. From the 1939 Art Deco Couture set to the 1967 Five Leaves clip belonging to Maria Callas, the story continues through many regal creations and generations. Most iconic, Van Cleef & Arpels unveiled The Duchesse Necklace in 2011, inspired by the classic Cravate necklace created in 1936 for the Duchess of Windsor. Part of the Bals de Légende line, it evokes the Maison’s flair for couture, and is now part of a private collection. Cut to the present day, and it’s evident that Van Cleef & Arpels and its affinity for rubies has culminated a particular essence of style. The gems themselves are individually selected for colour and vivacity, yet in their stylistic signature boast three interestingly contemporary characteristic traits. Adding a sense of dynamism, both the Rubis Impérial Necklace and the Élixir de Rubis necklace can be worn in multiple different ways. Executed in a subtle manner, these transformations are hidden from the naked eye, in a delicately masking structure. Asymmetry can be spotted on most creations, between the Berunda Bracelet, Rivières Necklace, or Kolam Between the Finger Ring. Used in both clear-cut and more clever ways, it features most intriguingly on the Unisson Earrings – wherein a perfectly symmetrical design meets an arrangement of stone colours that appear to be inverted. Patented by the Maison in 1933, the Mystery Set technique creates a three-dimensional form that hides its underlying metal to solely display the stones at their surface. This creates a velvety and soft texture at the top of the piece, as evidenced in the Amour Sacré clip. Beyond signatures, flexibility and comfort lies at the heart of all pieces. Volumes are raised and structures are carefully shaped, enabling the jewellery to perfectly align and match with the curve of the wrist or the neck. 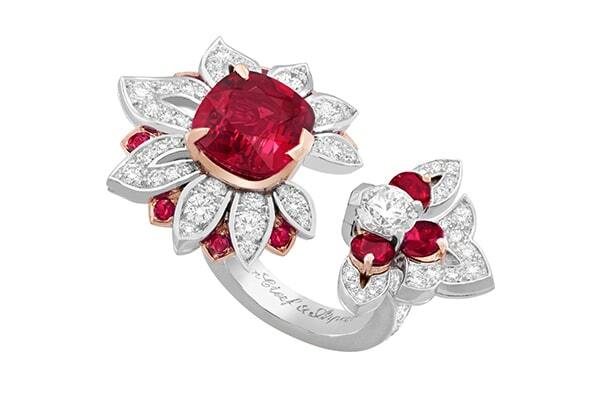 The Treasure of Rubies collection is composed of a number of distinct styles. From bold showstoppers to delicate and romantic swirls, take a look at some of the most notable creations below. 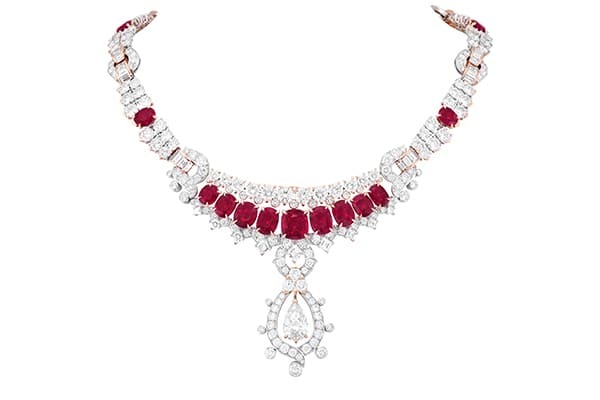 Rubis Flamboyant Transformable Necklace: white gold, pink gold, one cushion-cut ruby of 25.76 carats, 18 oval-cut and cushion-cut rubies for 30.40 carats, rubies, diamonds. Reflecting a passion for stones and a tradition of transformable creations, Rubis Flamboyant’s shining star is indisputably the necklace. The rough ruby at its centre was kept as a treasure by a family for many years, before being sold and cut into cushion shape. According to the Maison’s gemological experts, the colour of the ruby is “perfect”, and brought out even more so by the diamonds of various cuts around it. It impressively weighs over 25 carats. 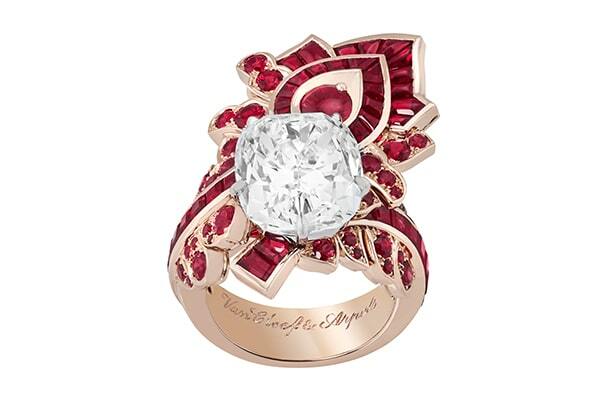 Feuille de Rubis Ring: pink gold, white gold, one cushion-cut DIF type 2A diamond of 9.05 carats, rubies. It is not uncommon for Van Cleef & Arpels to take inspiration from the metamorphoses of flora and fauna. The Feuille de Rubis Ring is no different, taking inspiration from Oriental motifs and subtle plays of light. Kolam Between the Finger Ring: white gold, pink gold, one cushion-cut ruby of 5.38 carats, rubies, diamonds. ‘Kolam’ comes from an Indian art form which uses grains of rice to create ephemeral motifs. Taking from this heritage and bringing a spirit of innovation to its design, the Kolam Between the Finger Ring features a vibrant hue and harmonious cut crafted to refract light with intensity. 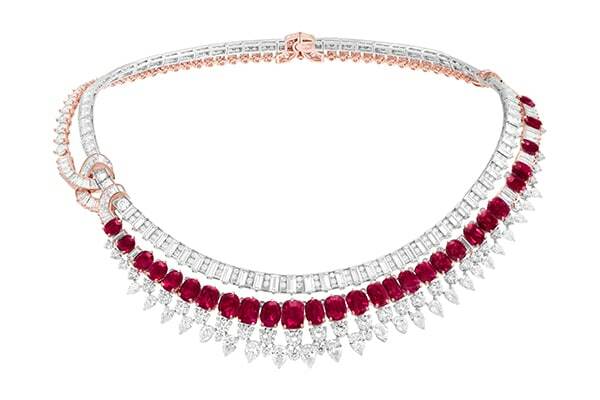 Rubis Impérial Transformable Necklace: white gold, pink gold, ruby beads for about 1,066 carats, diamonds. 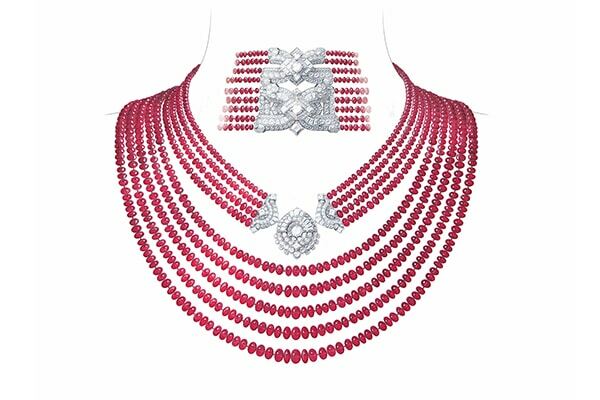 Paying homage to the precious necklaces of the Indian maharajas, the Rubis Impérial Transformable Necklace is a wildly eye-catching ensemble of great rarity. It features nine rows of ruby beads intricately assembled using traditional techniques, allowing for an intense interplay of colour and shade. It weighs a whopping total of over 1000 carats. Paisley Précieux Necklace with Detachable Pendant: white gold, pink gold, 16 cushion-cut rubies for 33.06 carats, one pear-shaped DIF type 2A diamond of 3.18 carats, rubies, diamonds. Boasting delicate volutes that evoke a charming paisley motif, the Paisley Précieux Necklace features a rare ensemble of 16 rubies at a total of 33.06 carats. Assembled in a falling line with a pear-shaped diamond as its star, Van Cleef & Arpels highlights again its love for transformative design with this piece, making the pendant detachable to wear on clasp or chain. 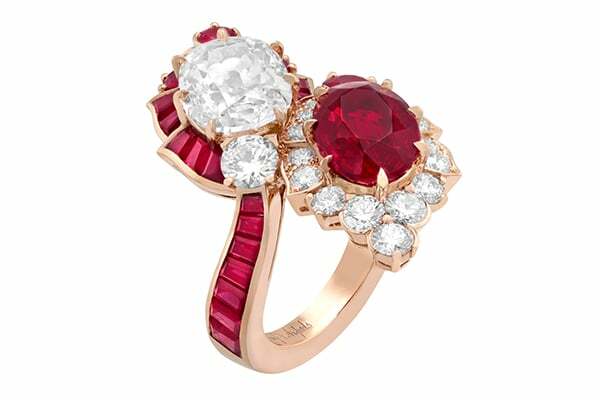 Zita Ring: pink gold, one oval-cut ruby of 3.81 carats, one cushion-cut DVVS1 diamond of 3.01 carats, rubies, diamonds. The Zita ring has quite possibly the most dreamily named setting of the lot: the toi et moi. Drawing on poetry of the Orient, the ring features two gems that flirt and twirl around each other in inverted symmetry, combining sparkle with fire in style. 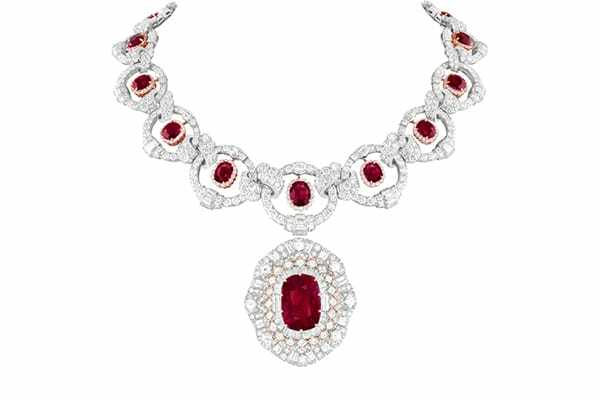 Rivières Necklace: white gold, pink gold, 28 oval-cut and cushion-cut rubies for 43.70 carats, diamonds. With a contemporary, asymmetric design that pulls from the world of couture with a subtle side bow, the Riviéres Necklace features 28 rubies in deep warm tones. 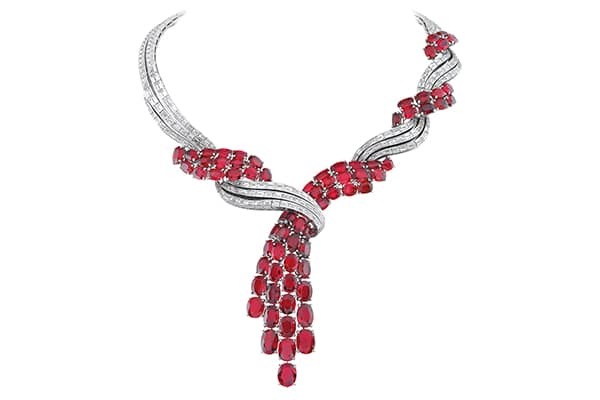 Accentuating the curve of the neck with their falling line, the design is illuminated by streams of diamonds, for a brilliant interplay of gems. 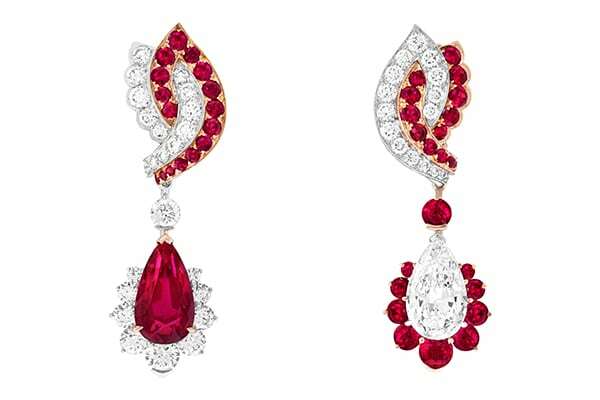 Unison Earrings with Detachable Pendants: white gold, pink gold, one pear-shaped ruby of 5.63 carats, one pear-shaped DVVS2 diamond of 3.01 carats, rubies, diamonds. Definitely an aesthetically intriguing one, the Unisson Earrings offer a mirror image of one another to create both harmony and contrast as a pair. They extend the line of the ear, culminating in a pear-shaped pendeloque and as a visual echo to one another. 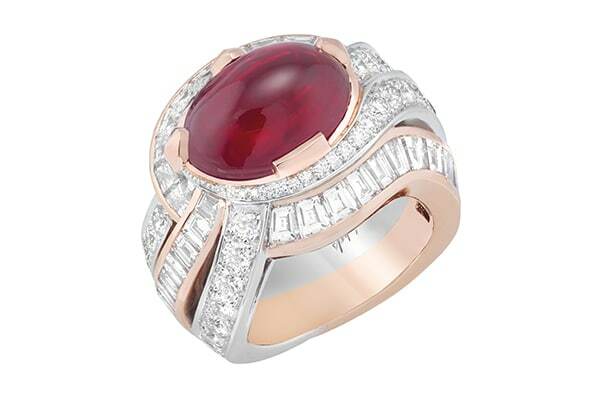 Soleil Levant Ring: white gold, pink gold, one cabochon-cut ruby of 10.53 carats, diamonds. The final category in the collection, Soleil Levant gives true pride of place to the ruby with a cabochon weighing over 10 carats. It is illuminated by three lines of diamonds, allowing for the deep colour to shine, yet still smother with a unique softness in a truly enriched tribute to the special stone.